Arctic employs 300+ Sales Representives in the United States and Canada. 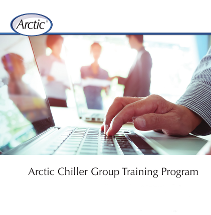 The Arctic Chiller Group is proud to offer a training and certification course to provide technicians with the necessary skills to maintain and troubleshoot Arctic chiller systems. This 3-day course covers the latest in Danfoss Turbocor® compressor technology, monitoring software, controllers, and Arctic chiller systems. Training Schedule: Available in the Training Program brochure and Arctic’s Events Calendar. There was no off-the-shelf technology available to meet this data center’s specific requirements. A team of experts that included Arctic engineers was assembled to create a custom solution for the client. The result? The first-of-its-kind ArcticCool ACW1400GT5022, a 1,400-ton chiller equipped with 7 Danfoss Turbocor® compressors.